The sad news that Stan Lee is dead has garnered countless tributes from fans and stars alike. His contribution to the world through his characters, and the message that being different was a strength not a weakness, shaped culture for decades. Long before 10 years of the MCU made him a globally recognised figure. As you can see, Lee, dressed in Metal Gear Solid gear announces himself as Revolver Ocelot, before giving the award to Kojima, who totally geeks out. It's not the only time the comic legend has spoken to Kojima, with Lee giving a special messages at Metal Gear's 2007 20th Anniversary celebration. 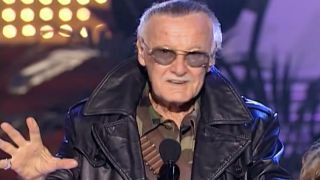 If you want to remember the great man in action then here's all the Stan Lee cameos from the Marvel movies cameo.